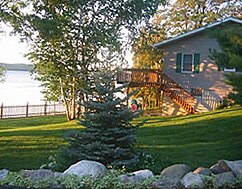 Your summer cottage rental is awaiting you with all of today’s amenities. Slow down for your week in Leelanau! Relax with a glass of wine on the private beach and marvel at the colorful sunsets. Both cottages have large open decks, high speed wireless internet, cable television, stunning decor, fully stocked kitchens. Each is equipped with a grill for your cookout. Each cottage has 75 feet of private sandy beach that is unshared. There are both shallow and deep water areas – this is great for families with small children. Both beaches have a designated firepit for enjoying cozy sunsets on cool summer nights and marshmallow roasts.